Three Vietnam veterans reunite for the funeral of one of their sons, a Marine killed on duty during the Iraq war. 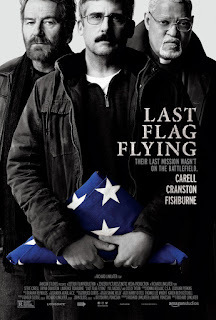 The three friends are played by Bryan Cranston, Laurence Fishburne and Steve Carell, based on characters from the 1973 comedy "The Last Detail." Carell persuades the friends he hasn't seen in thirty years, to travel with him to Dover Air Force Base to pick up his son's body. The three begin a long road trip, with stops in motels, cheap restaurants, changes of plans, train rides, and missed connections. The trio even work in a visit to the mother of a fallen comrade from their Vietnam days. "Boyhood" director Richard Linklater tells this story in his usual organic style. He lets his actors take their time, and Cranston especially chews the scenery. This approach makes for a long and sometimes irritating yarn. However, it leads to a surprisingly strong finale. "Last Flag Flying" ends so well, I almost forgive the meandering that gets us there. "Last Flag Flying," rated "R," 2½ stars. Does it deliver what it promises? Vietnam vet road picture. Is it entertaining? Runs long, but ends well. Is it worth the price of admission? Some will love it.